Venture Corporation's growth momentum was impressive with revenue from T&M/medical/others and networking & communications segments expanding 78.7% and 22.4% yoy respectively in 1Q17. We reduce our net profit forecasts by 3.3% for 2017 and 3.9% for 2018 as the sequential growth in subsequent quarters is expected to be gradual. Downgrade to HOLD as price upside is limited after the recent steep rally. We trim our target price to S$13.30. Entry price: S$12.00. Sturdy broad-based growth from T&M/Medical. We believe the 78.7% yoy revenue growth from Venture Corporation’s (Venture) test & measurement (T&M)/medical/others segment was broad-based with contributions from its diverse base of 70 customers. This segment accounted for 52.1% of total revenue, an expansion of 13.1ppt yoy. Venture ramped up production for semiconductor testers for KeySight and mass spectrometers for Fluke. Illumina launched a new model of the genome sequencer called Nova Seq in January and production volume has gradually increased. Venture commenced production for medical sensing devices, which are utilised to help the visually impaired sense their environment. There was also contribution from racing drones, which are highly manoeuvrable and are used in competition. Revenue from networking & communications segment grew 22.4% yoy in 1Q17, driven by production of fibre optics modules and sub-systems for Oclaro. Demand was boosted by migration to higher-speed 40Gbps and 100Gbps products. Expect gradual improvement in margins. Gross margin narrowed by 1ppt yoy to 21.6% in 1Q17. Venture launched new products for its customers in late-16. Production volumes for new products are currently modest but would be gradually ramped up, leading to better margins in the subsequent quarters (target: 22-24%). Benefitted from completion of amortisation for customer relationships. The amortisation of intangible assets for customer relationships from the acquisition of GES amounted to S$4.1m/quarter and S$16.4m/year and was fully completed in 2016. Thus, depreciation & amortisation dropped 38% yoy to S$6.6m in 1Q17. Venture conducts R&D and new product introduction (NPI) at its two facilities in Anaheim and Fremont in California. New products are then transferred to its facilities in Johor or Penang for mass production. 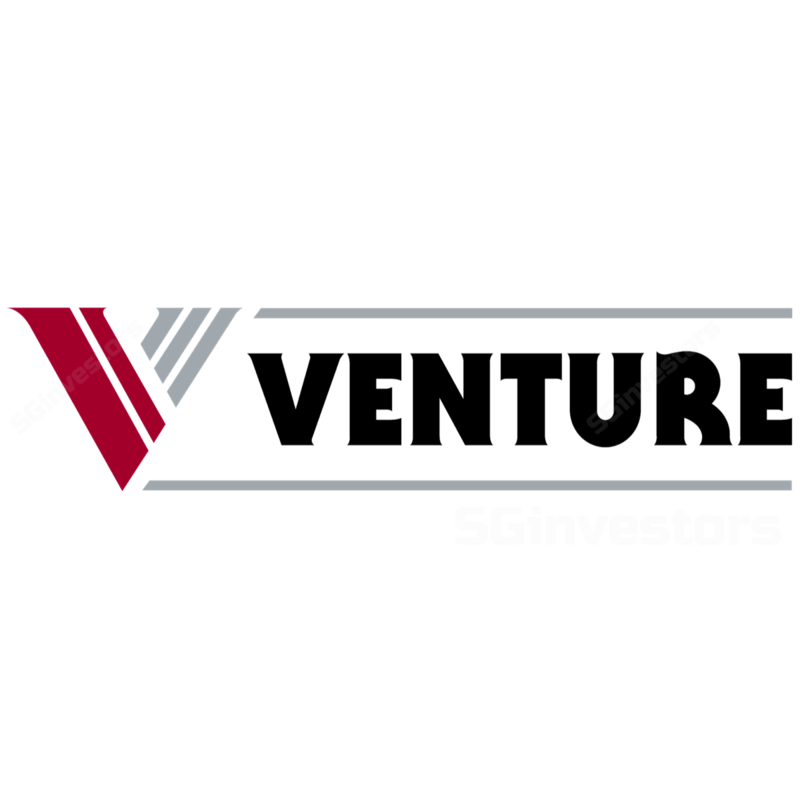 Venture leverages on the well-established manufacturing supply chain and eco-systems in Malaysia. The initial euphoria regarding “onshoring” has quietened. Venture and its customers do not face pressure to shift manufacturing to the US. Venture continues to work on improving its segmental reporting. It could adopt a new methodology for classification based on ecosystems. Many of its complex products are feature-rich. For example, many test & measurement products and retail store solutions have communications modules embedded. Thus, it is difficult to have a clear-cut segmental breakdown of its revenue. Venture focuses on excellence in quality, productivity and value creation. It achieved a strong start in 1Q17 and the positive growth momentum looks set to continue. However, management guided that sequential growth would be “gentle” over the next three quarters compared to steeper sequential pick-up in 2016. We expect Venture to declare dividend of 55 cents/share for 2017, assuming no competing needs for cash. The dividend payout ratio is manageable at 66.8% (2015: 89.1%, 2016: 75.9%). The stock provides a dividend yield of 4.2%. We reduce our net profit forecasts for 2017-18 by 3.3% and 3.9% respectively as the sequential pick-up in revenue is expected to be gradual. We trim our target price from S$13.60 to S$13.30, based on 16.2x 2017F PE (Benchmark Electronics: 22.4x, Plexus Corporation: 16.1x), justified by its average forward PE of 16.3x over the past 20 years. Further contribution from new products, particularly from the life sciences and industrial spaces as well as continued margin expansion. Dividend yield of 4.2%, one of the highest in the technology sector.